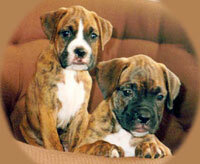 One of the most popular breeds in the world, the boxer retains a puppy like behaviour lifelong. It has a fast reaction time and is very good with children. Its muscular and intimidating appearance make it an excellent guard. 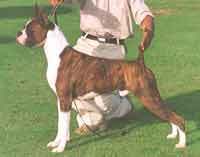 The boxer is a result of high quality designer dog breeding that was in fashion in Germany 100 yrs ago. It has a dark mask confined to the muzzle and its tail is traditionally docked. It weighs 25-32 kgs and is about 53-63 cms tall. 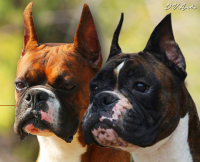 Rockford Boxers Presents Top class show quality Boxer Puppies From the Cream of American Lines! Available for True Show Homes. They are from a long line of imports and renowned champions. 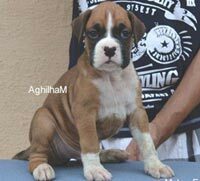 Quadro Boxers: We are having cute adorable boxer puppies for loving show homes. Puppies are carrying some very good American Bloodlines. Puppies are 8 weeks old as we advertise (26th November 2015). 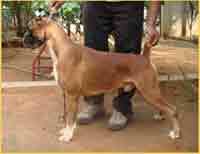 KCI (Kennel Club of India) registered and fully vaccinated. 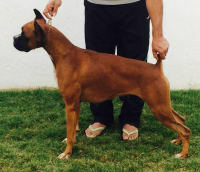 Goldstone's Boxers Goldstone's Boxers Presents Top class show quality Boxer Puppies, for True Show Homes. They are from a long line of Imports and Renowned Champions. 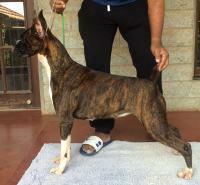 Sire: Goldstone's Golden Glory (S/o Ind. Ch. Sandgold's Kelox (Jr CHESS). Dam: Rockford's Little Miss Attitude (Hope) (D/o MBIS BISS Ind. Ch. Bub's International Travel Man (Duke). 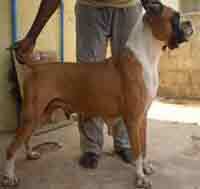 We provide two rounds of vaccination and de-worming and also KCI papers. All the puppies are having nice head, strong bones well balanced and high show prospect. Click Here to See Litter Box, Photographs of Sire, Dam and Puppies. 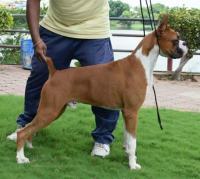 Jaisimha offers show quality KCI registered boxer puppies for loving show/pet homes. Puppies are 65 days old in the picture and are ready to go to their new homes. Enquires from serious buyers welcome. Click Here to See Litter Box, Photographs of Puppies, Sire and Dam. 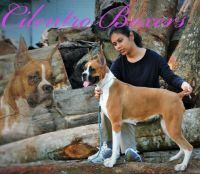 Cilentro Boxers Offers Show Quality Boxer Puppies for Show Homes. Click Here to See Litter Box, Photographs of Sire, Dam and Puppies and Pedigree Details. Satishkumar announces the arrival of a Wonderful Litter of Boxer Puppies out of the following combination: Sire: Hiddenite's Ecstasy (Ch.Bismark V D Hoevensehof x Can.Ch.Elharlen's Wishes N Dreams) X Dam: Ramlakshmi's Sweety (BISS.MBIS.MRBIS.Ind.Ch.Johny Walker x Ch.Cameo's Total Satisfaction). Click Here to See see Litter Box, Photographs, Pedigree details. Contact: L.Satishkumar: Mob: 0-98420-33000 (Coimbatore,Tamilnadu). Dr. Arun Vijayan, (Coimbatore) Mobile No: (0) 9865272234. "Aryanoush Boxers". 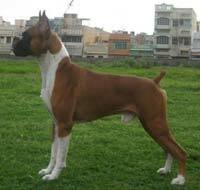 Rated as the top Boxer Kennel in Asia, in the book "The World of the Boxer " by Richard Tomita. Breeder of more than 50 Champions, 200 C.C's, 150 R.C.C's, winners. Breeder of the Year 95/96, 96/97, 97/98. 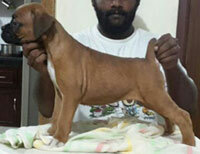 Show Quality Puppies avaialble on prior bookings. Contact: Nariman. 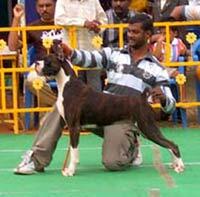 M. Shakeebai, " Aryanoush ", 6-3-577/1, Khairatabad, Hyderabad 500004. Tel : 91-40-3392664, 91-40- 3390665. For more details, please contact: Sandesh R.S. Harakanahalli Estate, Sakleshpur. 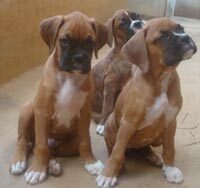 Kevin Moraes proudly presents our much awaited 1st litter of excellent show quality boxer pups out of top winning imported lineage. 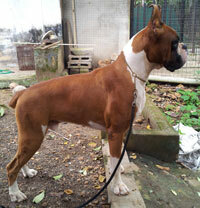 Sire: MBIS.Ch.Bubs International Travel and Man; Dam: Ch.Lastells Dream Catcher; Puppies born on the 1st of June. Click here to view litter box. For serious inquiries call: +91-9850943872. 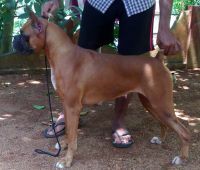 Agonistics boxers located in kerala. 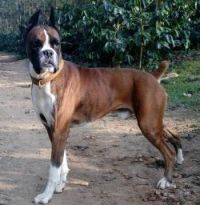 We work only with the best American & European Boxer Bloodlines exclusively and focus our breeding program with equal importance on genetics, anatomy, type, elegance, health character and temperament. 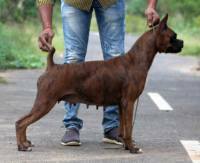 All of our dogs are healthy, Kennel Club of India registered and vaccinated as per schedule and dewormed regularly. 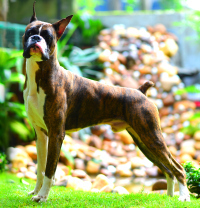 As breeders, we have a true love for the Boxer breed, Show quality boxers puppies are occasionally available to select homes. Click here to view litter box. For More Details Call +919745501118. 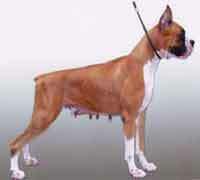 Hiddenite Boxers: Absolutely Top Of the Line Pedigree Boxers housed with us. 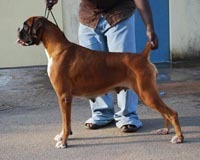 Puppies from the following combination available for sale. 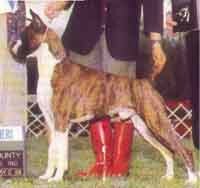 Sire: Ch.Bismarck V De Hoevensehof X Dam: Can.Ch.Elharlens Wishes And Dreams. To View Litter Box. Dhutibox's introduces Veni Vidi Vici del Colle dell'Infinito (Uno), Owned jointly with Mr Jamit Henry. 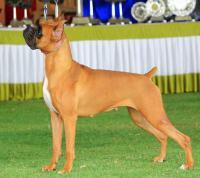 The first Del Colle Dell'infinito dog in India Breeder : Mr.Allessandro Tanoni , Italy. For more, information please call Mr.Sandeep Rao, Chennai on +91-98407-52774. Imported from Italy. 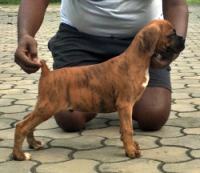 Ferrick Kennel proudly presents A Brindle Boxer Female Puppy For Sale. Ears Cropped. Sire: Walgre's Fist of Fury. Dam: Siya's Better Watch Out.